(leading to ExpertRating Teaching Certification). Learn how to successfully meet the diverse needs of the disabled students in your classroom from an experienced special educator. We'll dissect the whole special education process, from working with individualized education programs (IEPs) to helping students struggling with reading comprehension, math skills, and writing. We'll also talk about fun games you can incorporate, tips for modifying your classroom, and lots of tested methods for bringing out the best behavior in your students. Every teacher can have success teaching learning disabled kids. In this course, you'll discover easy, practical, and creative strategies that will help your struggling students find their light bulb moments! This course includes a knowledgeable and caring instructor who will guide you through your lessons, facilitate discussions, and answer your questions. The instructor for this course will be Sara Hardin. About the ExpertRating Online Teaching Course (Teaching Learning Disabled Students) instructor : Working with special needs students became a passion for Sara Hardin in seventh grade, when she volunteered at a summer camp for physically disabled children. Their willingness to keep trying new things, despite serious obstacles, impressed her and inspired her to become a special educator. She holds a master's degree in special education and has taught special education classes, mostly at the elementary level, for nine years. Teaching Students with Learning Disability-Course requirements: For taking this instructor led ExpertRating Online Teaching Course (Teaching Learning Disabled Students) you need Internet access, e-mail, and the Microsoft Internet Explorer or Mozilla Firefox Web browser. "As a certified teacher who has been out of the classroom for many years and is now back in the field, it was just what I needed for considering a certification in special education. Thank you so much." "EXCELLENT COURSE!!! I would highly recommend this course to any teacher that deals with any type of student. 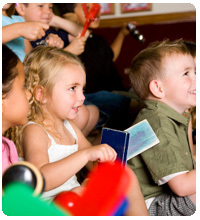 Her teaching tips can be used for a seasoned or new instructor. I wish I could have had her as a teacher. What a wonderful gift to her school system!!!" "Good information with lots of practical suggestions to try right away. Very useful." "I am not an educator. I [recently] retired from AACO Detention Center…I have a strong desire, no, a love to teach LD STUDENTS. The instructor kept my interest and left me wanting more!!!!!!!!! She did a super job and I will be looking for other classes to take with her." "I highly recommend this course even to those veterans in the teaching profession. More students are being diagnosed with LD and we all need to be prepared to work with them." "I loved Sara's positive and practical knowledge of the classroom. The additional resources she recommended were great. I would love to take some more classes under her." "I really enjoyed the course. The instructor was very knowledgeable and helpful!!!" "I will be co-teaching next year. This was a wonderful prep course and review of some valued strategies I hope to incorporate and revisit. Thank you so very much." "Thank you for the fresh ideas to help LD children. I especially enjoyed the language arts and writing ideas." "The instructor was very organized and thorough. I like the fact that she started with the basics and didn't assume what we already knew (or didn't know for that matter!). Sara has a great writing style and it made the lessons fun and easy to read. Thanks for a wonderful online class!!!" "This class was very useful, especially for new teachers. I feel a teacher in any subject /grade would benefit and develop a better understanding of students with a learning disability." "This was the very BEST internet class I have ever taken! Our instructor was wonderful, very interactive with me, and all lessons were relevant and useful!! I would look forward to taking any other course that this instructor teaches!!" "Wonderful course - loved the practical suggestions!" ExpertRating is one of the world's only ISO 9001:2015 Certified companies (from TUV America) offering an Online Teaching (Teaching Learning Disabled Students) Course (leading to ExpertRating Teaching (Teaching Learning Disabled Students) Skills Certification). When you choose the ExpertRating Online Teaching Course (Teaching Learning Disabled Students) you can be sure that you are buying a premium International certification that is recognized by hundreds of employers and Government bodies in the US and other countries. With ExpertRating you get certified quickly online and you are equipped with a store house of information through the in-depth ExpertRating Online Teaching Course (Teaching Learning Disabled Students) Courseware which has been developed by experienced Entertainment Industry Experts. You can buy this ExpertRating Online Teaching Course (Teaching Learning Disabled Students) leading to Teaching certification at a special offer price of only $129.99 which includes the in-depth ExpertRating Online Teaching Course (Teaching Learning Disabled Students) Courseware and exam fee. 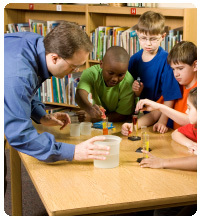 This is the best value for money Teaching Program available till date. You get the following services within the USD $129.99 fee. In-depth ExpertRating Online Teaching Course (Teaching Learning Disabled Students) Courseware including scenarios and case studies. The process of getting yourself certified is very simple. 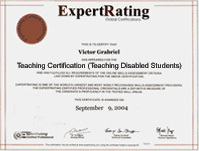 All you have to do is buy the ExpertRating Online Teaching Course (Teaching Learning Disabled Students) for $129.99. Log in to the instructor led course using your password. Go through the ExpertRating Online Teaching Course (Teaching Learning Disabled Students) Courseware (which would take you 6 weeks) and complete the final Teaching Certification exam at your convenience. You can complete the exam within 2 months of buying the Teaching Certification. The result of the exam appears as soon as it is completed, and your Teaching Certificate is mailed immediately. The final exam is fully based upon the ExpertRating Online Teaching Course (Teaching Learning Disabled Students) Courseware that is provided along with the Teaching Certification. If you have gone through the courseware properly you should not have a problem clearing the exam. The exam consists of multiple choice questions from all chapters of the ExpertRating Online Teaching Course (Teaching Learning Disabled Students) Courseware. The Working Successfully with Learning Disabled Students course will give you important tips on how to successfully deal with such students. Learning disability is a group of disorders which affect a broad range of academic and functional skills which includes the inability to speak, listen, read, write, spell, reason and organize information correctly. Having a learning disability does not necessarily mean that the person is low on intelligence. In fact, research has proven that some people with learning disabilities possess average or above-average intelligence. This course will discuss how to meet the needs of disabled students. This is a valuable course for anxious parents and teachers who will be able to improve the self-esteem, educational, vocational and socialization needs of disabled students after completing this course. The ExpertRating Working Successfully with Learning Disabled Students Certification course will suggest you tips and techniques on how to deal with disabled students. One in seven Americans has a learning disability. That means that in your class of 28 students, four could have significant trouble keeping up with the basics. This first lesson will investigate what learning disabilities (LDs) are and define some common types of LDs that you'll see again and again in the classroom. After that, it will take a few minutes to switch roles with all learners and see what it's like to try to work past an LD. Is Tamara having trouble with reading because it's not her favorite subject, or is something else going on? The process of identifying LD students is a long and sometimes tedious one. But with the proper expectations and the right dose of compassion, teachers can have success in the investigatory prereferral process. It will be discussed in this lesson. This lesson will discuss IEPs, which are road maps that guide the learning curve of every LD child. Written specifically to address individual needs, these legal documents are both confusing and complicated. But once you know how to decode the language and the sections, it's easy to start using IEPs as the helpful tools they're meant to be. LD students receive IEP-mandated services in a number of ways. Whether they mostly stay in their classroom or spend some time in the special education room, they're going to learn a bit differently than other students. This lesson will take a look at the common service locations that help LD students meet educational goals. You all remember that one teacher who really made a difference in your lives. The right teaching strategies spell out the difference between a creative, engaging classroom and one that stagnates without reaching most of its students. This lesson will talk about the teaching strategies that make learning memorable for LD students. Word identification problems can make "cat" look like "can" or "pan." Imagine how hard it would be to read all the wrong words in all the right places. In this lesson, you'll discover smart strategies to help student find their words. For students who have trouble reading, it's hard enough to just get the words right. But to pair those words with their meaning is a seemingly insurmountable task. This lesson will go over how to chunk information so students can understand what they're reading and fall in love with texts. Writing poses quite a few challenges for LD students. Some of them have trouble holding their pencils, and others find it difficult to communicate what it is they're trying to say. This lesson will take a tour of strategies that bring writing to life for students who often don't even realize all the neat things they have to say. A lot of LD students dread math because it requires a lot of skills to come together seamlessly and at the same time: Reasoning, logic, number sense, writing, and computation are all key. But math doesn't have to be so scary. This lesson will discuss how to make all those numbers a little easier for LD students to manipulate. Even though the IEP gives you a general idea of how to help your LD students, you'll still need to explore new, innovative ideas to modify your classroom, assignments, and tests, and that's what will be discussed in this lesson. These modifications often spell success for the LD students who need just a little push in the right direction. You've all had days when going to school was a drag. LD students are no different. Because school forces them to tackle big challenges head on, it's often their least favorite thing to do. This can lead to big behavior problems that you'll have to defuse creatively. This lesson will take a look at some great strategies. The connection between home and school is a powerful predictor of the LD student's classroom success. So this final lesson will discuss the best ways to conduct meaningful parent-teacher conferences that help everyone unite behind an LD child in need.